Ras Beirut is gentrifying. Also due to a rise in the land value, old buildings (20%) in Ras Beirut are under pressure of demolition. Developers aim to build high- rise skyscrapers that are exclusive to the high-end price range. A high demand for student housing due to the presence of university campuses reflects as high occupancy of students in small scale hotels. The strategy is to reverse this challenge from privatization by forming a co-operative;by the students’ association, universities, hotel owners and old tenants. In order to cope up with the F.A.R. of the lots, introducing modular pre-fabricated units for students with effective floor area will act as a plug-in solution against high land value of the lots. The evictions of old tenants with a strategy of Retrofitting the old apartments into new smaller areas and introducing new student housing units in the apartments will allow for affordability and fair rent. The modular student housing can be adjusted as per various site contexts of old buildings that face similar threats. Eventually it will densify the urbanscape of Ras Beirut with more inclusivity. its back to the vast sea. Lack of free public spaces and green areas within the city show a rising consumeristic lifestyle as an only option for recreation. The need for sustainable urban change has become an alarming issue. Each neighborhood poses multiple problems ranging from evictions of old tenants to invested empty apartments; from impacts of the refugee crisis on the public services to the non-conformation of a political head. Dry construction technique for stacked floors and minimal service modules. Ras Beirut lies towards the sea at the north tip of Beirut. Its a neighborhood challenged by the investments by rich expats and other nationals. The presence of the American University of Beirut leaves some hope for the urban revival of the area. One can easily spot the street outside the campus bustling with social activities. The force of this motivated youth has the potential to bring change in the urbanity. The university also pools in a large number of students and but lacks adequate housing. This makes for the large student population renting old apartments and the small hotels offering semesterly rates for their rooms. The moduler student housing can be attached to the old buildings spread across Ras Beirut (40%) and strengthen the lots' economic scheme. Many foreign students also create a good mix of exposure and diversity. A student housing creates a new market for the local shops as the masses looks for their daily needs. The student unit block is of a transient and minimalistic nature that challenges the opulence of exclusivity seen in high-end apartments. This stark contrast presents itself as a remedy to the threat of evictions. 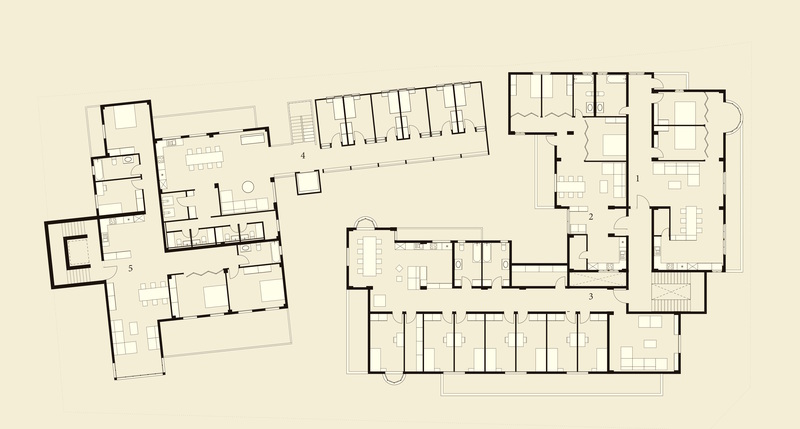 A cooperative model between the students’ association, universities, hotel owners and the old tenants of the existing building, creates a sheltered condition for the old tenants and increases affordability. The initial funding is by the univeristies in close links with the students association. Many students live at rented rooms of the small scale hotels of Ras Beirut. This is a current trend and is seen as an opportunity to engage with the private sector for viable economic solution. Also, the hotel owners' association benefits from the cooperative model as a sure source of rented student housing. The old tenants in their new renovated apatments will remain at the same location with fair rents for smaller homes. Student houses will be renovated from parts of the apartments. The pre- fabricated student tower accounts for the excess F.A.R. Area and can be easily adjusted in the site context. The additional rooms created will further strengthen the capital gains via rents. Thus the Ras Beirut collective is an alternative to reverse the inevitable densification of the neighborhood without loosing its diverse character.